Summary: A strange alien has just blown up the moon! What will he do next? He will do what any yellow tentacled alien would do, teach a class of misfits in the outskirts of Japan. Kuro-sensei is going to teach these outcast students for a year, and then he will blow up the Earth. That is unless someone in the class can assassinate him before the end of the school year. To sweeten the deal, whoever assassinates the teacher receives a large cash prize. To put yet another twist on the matter, he is the best teacher they have ever had, making it increasingly difficult to attempt assassination. 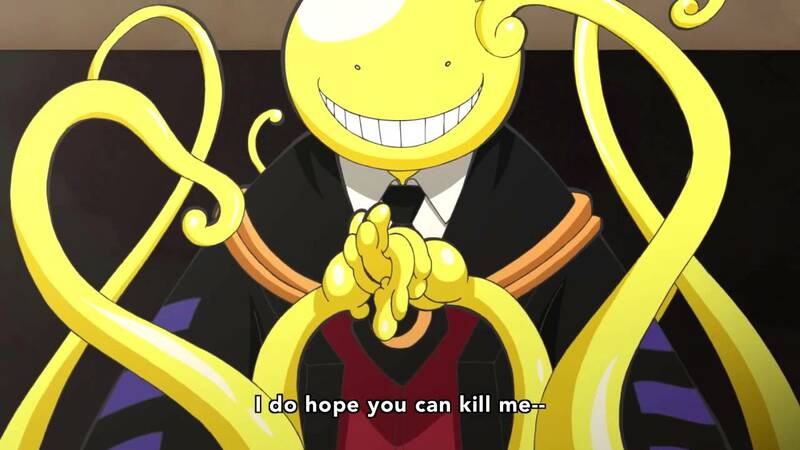 Assassination Classroom combines a wide variety of genres to make an incredibly enjoyable anime. It uses slice of life with it being set in a junior high, it brings in action with occasional assassination attempts, it adds the supernatural aspect with the tentacled alien teacher, and it adds comedy throughout the episodes with jokes and by playing on multiple anime stereotypes, such as the classic hot springs episode, the mysterious transfer student, sitting at the back of the class by the window, and even the typical harem additions, which are in the form of assassin additions without the harem aspect. The story in Assassination Classroom is silly and fun. The characters are enjoyable, even though there are perhaps too many to focus on at times. 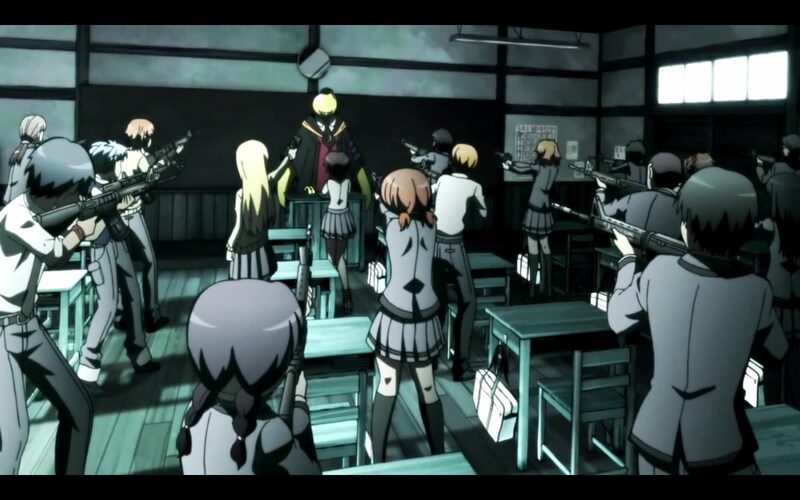 After all, it is a full room of students that are attempting to assassinate their alien teacher, and pretty much every student is focused on in one episode or another. In addition to the students, the teachers are likable characters for the most part. 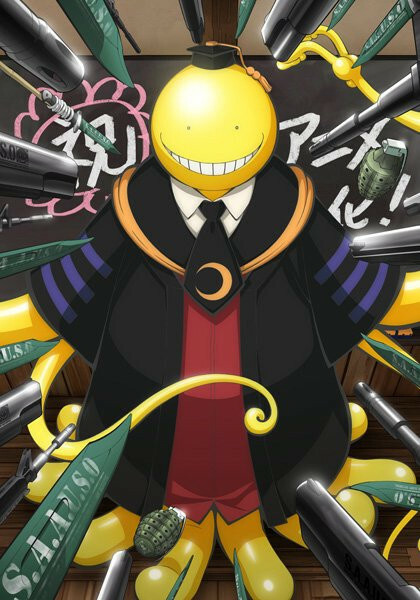 As for the alien teacher, Koro-sensei, he is a mysterious extraterrestrial creature that leaves you wondering what his motives are. Why did he blow up the moon? Why is he teaching this class? Why is he such a lovable alien that cares so much about the students? You might enjoy this if: You are ready to marathon an entire series without realizing how many episodes have gone by. You might not like it if: You are a traditionalist when it comes to alien mannerisms. Note to the Viewer: For an anime focused on a classroom full of assassins, Assassination Classroom is surprisingly low in violence. This entry was posted in Anime and tagged 2015, action, anime, ansatsu, assassination, classroom, comedy, fi, fragglepuss, kyoushitsu, review, school, sci, sci-fi, supernatural, teacher, winter. Bookmark the permalink.